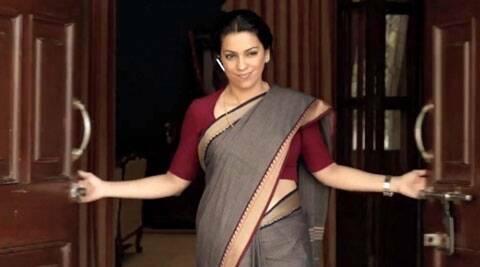 Controversial film of the month 'Gulaab Gang's second lead Juhi Chawla is having a good time. Controversial film of the month ‘Gulaab Gang’s second lead Juhi Chawla is having a good time reading the reviews of her latest release, where she has played a negative role for the first time ever in her carrier. Juhi had also thanked all her fans for the overwhelming response. “Thank you very very much…Am amazed and grateful for the overwhelming response to the movie ‘Gulaab Gang’. Thank you ALL,” she had posted earlier. According to The Indian Express review, Gulaab Gang has nothing to do with Sampat Pal’s real-life ‘Gulaabi Gang’ even if both wear pink saris, and fight for women’s rights in a rural North Indian outpost. The difference between the two films ( and ‘Gulaabi Gang’ did the smart thing by releasing just ahead of the Bollywood take) is stark : the first , featuring the plain-faced Sampat, is a hard-hitting documentary ; Madhuri Dixit’s gang, on the other hand, is as make-believe as make-believe can get. ‘Gulaab Gang’ is faking it. The movie, which even stars Madhuri Dixit, released Friday, a day before International Women’s Day.